Yorkshire Terrier January 3, 2019 April 12, 2019 No Comments on Are Apples Beneficial for Yorkies? As we know that dogs are carnivores but they also like to eat veggies. Many dogs get overweight or get sick because of people food that includes beans, bananas, citrus, etc. 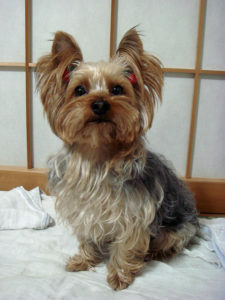 Owners must be well aware that there are some fruits and vegetables which are not appropriate for the Yorkie’s health. Moreover, it is important to provide essential nutrients and vitamins to keep your dog healthy. Are apples are beneficial for your puppy? Apple is rich in Vitamin A, K, C, calcium, and pectin that is very useful for the dog. The skin of the apple contains various types of plant chemicals that might cause cancer in humans. When you give the apple to your dog then make it sure that it is free of seeds because seeds consist of cyanide that can make the dog’s tummy upset. There are several ways to serve apples. You can give apple in the form of small slices or as a dinner topping in grated form. Simply peel off the apple and cut it into small pieces so your Yorkie will be able to eat it properly. Moreover, always keep in mind that fruits contain a high amount of sugar level. Therefore, it is necessary to provide fruit to the Yorkie in a limited amount so it would be able to digest it in a proper manner. Apples are outstanding antioxidants and act as a low protein snack to the Yorkie. It also contains a high amount of fiber so you can make your Yorkie healthy by providing a moderate amount of Apple. Yorkies are meat eaters and fruit is not an alternate of the meat. Provide them a balanced diet which is important for the energy and protein of the dog.